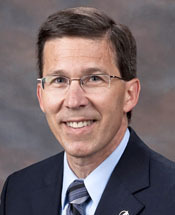 Dr. Wayne Goodman is senior vice president of the Operations and Support Group, with oversight responsibility for Corporate Communications, Diversity and EEO, Facilities, Finance and Business Operations, Human Resources, Security and Safety, and The Aerospace Institute. He assumed this position on July 1, 2014. Goodman was formerly the vice president of Space Program Operations, where he worked with the Air Force, government, and industry partners to develop military satellites and to advance national security space systems. He oversaw four major mission areas – communications, surveillance, weather, and navigation – and assisted with the development of system requirements, provided schedule/cost risk assessments, and solved systems development problems. Before being named vice president, Goodman served as the general manager, MILSATCOM Division, with responsibility for systems engineering support to the U.S. Air Force Space and Missile Systems Center in the architecture, acquisition, development, and orbital operation of super high frequency and extremely high frequency satellite communication systems. Goodman has held a number of increasingly more responsible positions at the corporation, including systems director, Corporate Chief Architect/ Engineer’s Office; principal director, Evolved Expendable Launch Vehicle Directorate; general manager, Launch Vehicle Engineering and Analysis Division; and general manager, Launch and Satellite Division, among other positions. Goodman joined the corporation in 1987 as a member of the technical staff, Structural Technology Department. Goodman earned a bachelor’s degree in mechanical engineering from Drexel University in Philadelphia, and a master’s and doctorate in mechanical engineering, both from the University of California, Berkeley. Goodman is a Fellow of the American Institute of Aeronautics and Astronautics. He is a member of three university boards: Board of External Advisors, Mechanical Engineering Dept. at UC Berkeley; Advisory Board, Astronautical Engineering Dept. at USC; and Engineering Dean’s Advisory Council at UCLA. He served on the Air Force Scientific Advisory Board from 2006-2010. Goodman received the Meritorious Civilian Service Award from the Department of the Air Force in 2010 and The Aerospace Corporation’s President’s Achievement Award in 1997.